Last fall President JoAnne announced that our club would work with other community leaders to create a one-of-a-kind Stable to be built in Walkers Point. On July 10th, Stable Campaign Co-Chair Kent Lovern announced that 174 members pitched in to donate a total of $250,000 to the project. Thank you, Rotarians! And special thanks to the campaign co-chairs: Kent Lovern, Jill Pelisek and Toby Reynolds. 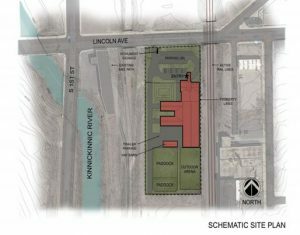 You may recall that we initially spoke of this project as the Lincoln Avenue Stables. Over the past several months, the name transitioned to Milwaukee Urban Stables, as a way to highlight one of the most unique features of the project –its urban location. The project continues to make good progress. 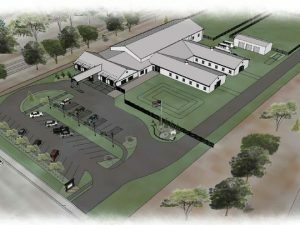 A groundbreaking is expected this fall with an intention to have the Stable up and running by the fall of 2019. More information can be found on our website. Official rendering from Uihlein Wilson Ramlow Stein. Location: Located on the southeast corner of First Street & Lincoln Avenue on four acres donated by the city. The Stable will enhance the community connection in the Harbor District neighborhood. Project Cost: $5.35 million. Public support $1.5 million and $3.35 million in private donations have been pledged. Volunteer Opportunities: Rotarians will be able to find meaningful ways to contribute their time and their talents including nonprofit board membership, assisting with equine-assisted therapy programs, and co-facilitating youth programming with the MPD.